207 Palestinian were injured, 199 in the west bank and 8 in Gaza. Casualties included 11 injuries with live bullets and 63 with rubber bullets and 123 suffocations with tear gas and 10 injuries due to beating. Raids and arrests in several areas in the West Bank were carried out: young men, including 41 minors were arrested. These arrests were mainly focused in Jerusalem, Hebron, Tulkarem, Nablus and Jenin. According to the prisoners’ association, the Israeli Occupation Forces ordered administrative detention against 33 of the new prisoners. Their arrest period has been decreed to be between 3 months and 6 months, detention has also been extended to another 68 prisoners. The 13 Reservist Brigades, and Border Police deployed in Jerusalem and in the 1948 Occupied Palestine, in addition to the 4 new brigades deployed in the West Bank and 4000 police and Special Forces in Jerusalem that have been sent by the occupation authority are still widely standing on the main streets and at the check points in different areas. Continuous clashes with the Occupation Forces begin at noon and continue until midnight in more than 30 sites in the West bank and Gaza and in the ‘48 Occupied Palestine. The clashes include stonethrowing andMolotovs in: Silwan, Ras Al- Amoud neighborhood, Al- Toor neighborhood, Al- Issaweieh, Al-Ram, Qalandia’s checkpoint, Shu’faat refugees camp, the old city of Jerusalem, Jabal Al-Mukaber, BeitHanina, Al- Izarieh, Abu Deis, Hizma, Al- Shayiah neighborhood, Salman Al- Faresih Street, Qatnah village northwest of Jerusalem, Al- Sa’diyeh and Bab Hutah, around Bilal Bin Rabah Mosque, Al Dheisheh Refugees Camp, BeitEil’s Checkpoint, around Al- Maydan square southeast Hebron, Beit Neim and Halhoul and Soreef villages, Al- Aroub Refugees camp, Al-Shuhada’ street in Hebron old city and the East of Al- Breij Refugee camp in the center of Gaza near Beit Hanoun crossing. Also, the Israeli planes flew over the areas of the clashe at the east of Al- Breij refugee camp. Continuous assaults by the Israeli forces on several foreign press reporters and on the Palestinian reporter May Abu Assab while they were covering the clashes in Hebron. Continuous daily attacks by settlers against citizens and Palestinian farmers on the main roads and villages’ entrances situated near the settlements. A group of settlers burned large areas of the agricultural lands of Burin village, in addition to assaulting farmers while they were olive picking which led to the injury of numerous farmers and a British volunteer with bruises and cuts. As an implementation of the group punishment policy, the Israeli Government has decided, according to its Prime Minister, to withdraw the citizenship of 19 Jerusalemite family and to confiscate the lands of the houses of those who were involved in recent attacks in Jerusalem. The government has decided to confiscate their lands after demolishing their houses, in addition to cancelling the provisions given to their families. Moreover, the Prime Minister emphasized that his government will not allow the reconstruction of the houses of those who were involved in any attacks after demolishing it. Ibrahim Dar Yousef (46) from Al Janyieh village ,West of Ramallah, died today. He was assaulted, humiliated and detained for two hours, after he was returning with his wife from olive picking at the entrance of the village near the road junction of Talmond settlement. 15 minutes after he was released, he fell on the ground before he was able to get to his house suffering from a heart attack and was transferred to Palestine medical complex, he died just after arrival. He was father of seven children. 49 Palestinians were injured, 36 of them in the West Bank, 13 in Gaza. 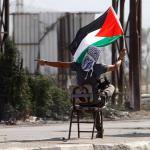 The injuries included 4 with live bullets, 11 with rubber bullets and 32 suffocations and 2 burn injuries. Raids and arrests in separate areas in the West Bank of 26 young Palestinians mainly in Nablus, Ramallah, Jericho, Bethlehem, Hebron and Jerusalem. Continuous daily attacks by settlers against citizens and Palestinian farmers on the main roads and villages’ entrances placed near settlements. A group of settlers assaulted the farmers and set fire to their lands in Qabalan, South Nablus. Also, this Thursday, the Israeli soldiers assaulted an elderly called Rabeha Obaid (60) while she was olive picking in her land in Kufur Qadoum at the East of Qalqilya. As an implementation of the group punishment policy, the Israeli military announced that it will demolish 7 houses in the West Bank belonging to the families of those who were involved in recent attacks, and other houses in Qalandia refugee camp.